Mike Myers really did have an ex give him a gun rack. A week after his ex broke up with him, she tried to win him back by getting him a gun-rack, which she thought he would find hilarious. It didn’t work. 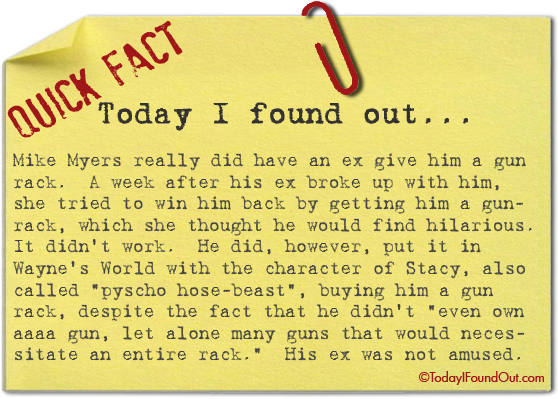 He did, however, put it in Wayne’s World with the character of Stacy, also called “pyscho hose-beast”, buying him a gun rack, despite the fact that he didn’t “even own aaaa gun, let alone many guns that would necessitate an entire rack.” His ex was not amused. The title is really misleading. Try using “had” instead of “did have” to make it sound less like Mike commanded his ex to give him the rack. Interesting bit of trivia though.